I’ve been there before. It’s your responsibility to design and run an offseason weight training program for your high school baseball team. You also may be a new head coach with a ton of responsibilities that include tryouts, practice plans, etc. This takes an incredible amount of time to administer but even more time to design from scratch. 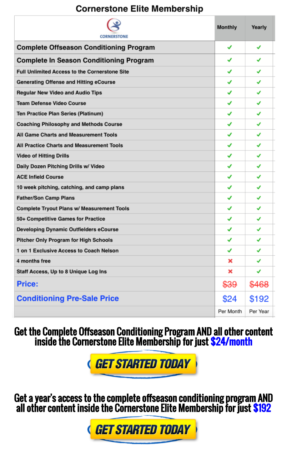 This Baseball Conditioning Program contains day-by-day workouts for the entire offseason and in-season for high school aged players and above. The best part about this program is that you will get access to the ELITE member areas of the CCA website. Whether you are a new baseball coach or a seasoned veteran, the resourced Coach Nelson provides are invaluable. I’ve incorporated a ton of these into my training and coaching of high school teams through the years and want to share them. This program tells you exactly what workouts you should be doing on each day to keep your athletes safe from overtraining while ensuring maximum gains that will transfer to the baseball field. Perfect for High School coaches short on time. The best part about this program is that you will get access to the ELITE member areas of the CCA website. Whether you are a new baseball coach or a seasoned veteran, the resourced Coach Nelson provides are invaluable. I’ve incorporated a ton of these into my training and coaching of high school teams.